1. What is stacking/a stacked image? 2. How did you get a subject to sit still for 99+ shots? This blog should hopefully clear things up. What is a stacked image? 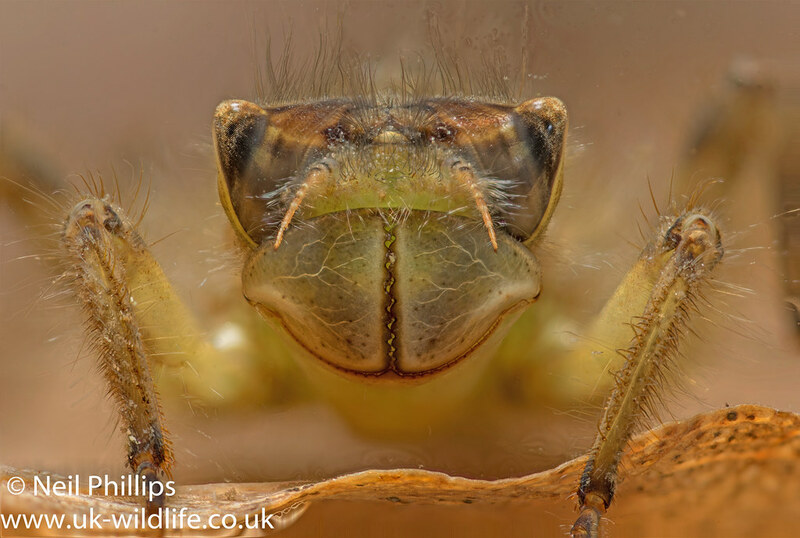 When photographing a macro subject, especially close ups, there is often an issue with depth of field. To get all of the subject in focus the lens has to be stopped down to a smaller aperture which means less light is reaching the sensor and a higher, noisier ISO will have to be used or a slower shutter speed will result. You can use artificial light such as a flash to get round this, but once the aperture gets small enough (usually smaller than f11) the images are noticeably softened by effect of diffraction. Stacking is one way round this. It involves taking a series of images at incrementally (and overlapping) different focus distances and merging the in focus parts of each together to form one composite image with it all in focus. For example the 1st image would focus on the part of an insect closest to the camera, usually the tip of the antennae, the next image is focused on the the next antennae segment and the back of the tip, the next photo the next segment and so on. This is achieved by either slowly moving (or rocking) the camera forwards, often with a focus rail which allows fine control of movement or changing the focus distance. In theory with enough images you can get everything from minimum focus distance to infinity focus distance in focus in one image. This image was taken by focusing on the closest part of the nymph, taking a photo and then sliding the camera forward a tiny amount, taking the next photo and repeating for 27 images, before combining them on a PC afterwards. The problem is it requires the subject to be still throughout the whole process, which can last many minutes. This makes photograph of live subjects, which tend to move, difficult to get successful stacked images of, which is why many stacks are of dead specimens. So it is understandable how well versed macro photographers are wondering how I got my shots. Hopefully the following will explain how. How does it work on Olympus cameras? The Olympus EM1 mark ii has an electronic shutter mode which allows 60 frames per second. The focus bracketing mode uses this, taking a shot and focusing slightly further away, taking a shot and focusing slightly further away, and so on for up to 999 shots. This means taking 100 or so shots only takes a few seconds, increasing the chances of the subject staying still throughout the process. Here is a video of the process, and a good example of how the subject often moves just before it finishes! Even with technological advances, wildlife still finds a away to be awkward! It also means stacking larger numbers of images taken in the field becomes much more realistic possibility. With a subject sitting still, and of course not moving in the wind, it is possible to carry out hand held stacks (especially with something to rest/brace the camera on for stability). 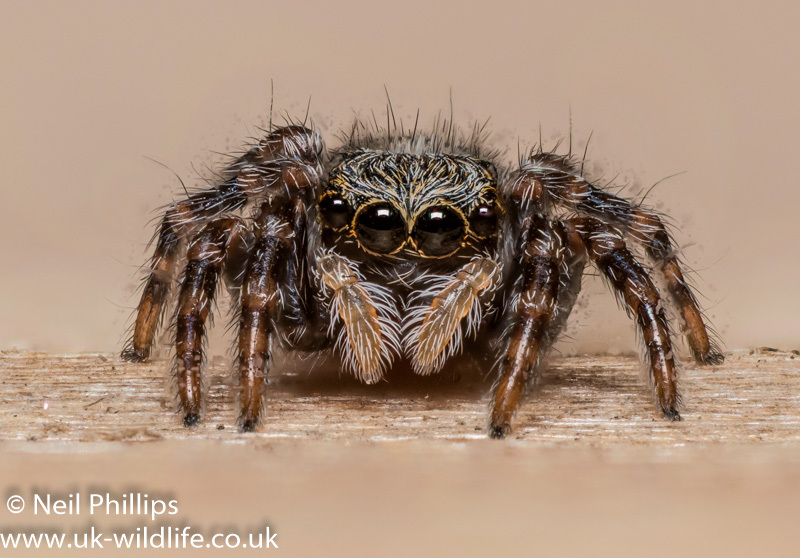 This shot of a jumping spider was 99 images taken by holding the camera on the vertical wall by hand. They were tacked using CombineZM and rotated 90 degrees on the PC afterwards. 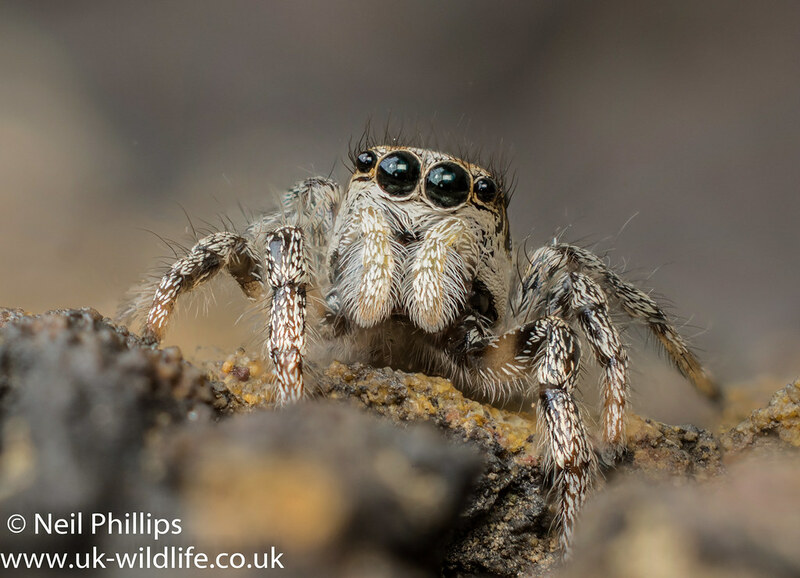 It is useful not just for macro subjects and even usable with the 300mm f4. 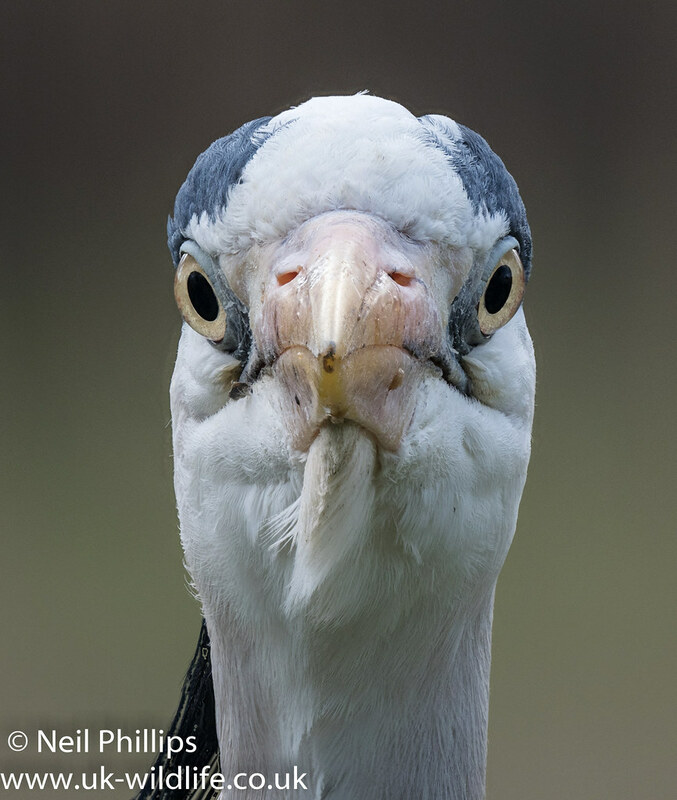 Here is a handheld 50+ images stack of a heron. The Olympus EM1 mkii also has what I refer to as the ‘auto stacking mode’, one of the option within the bracketing mode option is to turn on ‘stacking’. It will take up to 8 images and stack them in camera (though it also keeps the original 8 raw files) and producing a jpeg stacked image. Although it takes a bit longer, this can be useful to see what you can get with the stacked images as you take them. 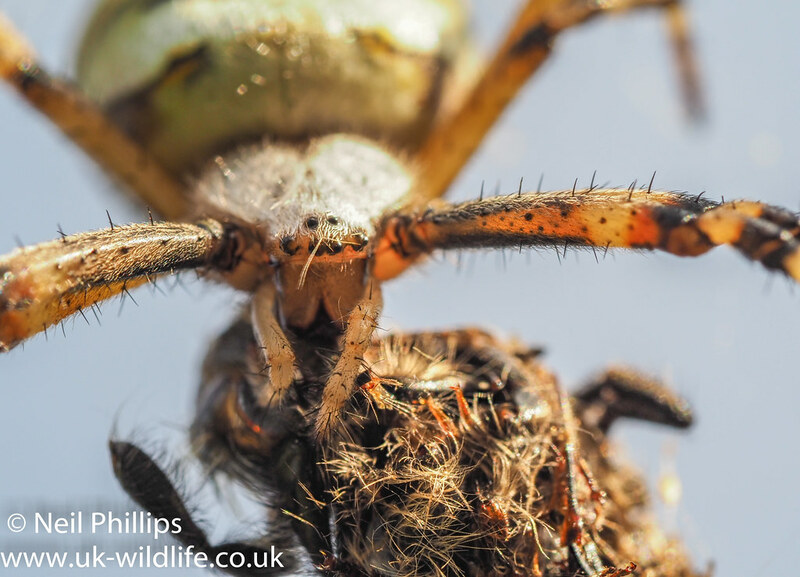 This wasp spider was an 8 image stack in the field shooting straight upwards with the camera on the ground. This all makes stacking a lot easier and this spring I have been having a lot of fun with it!